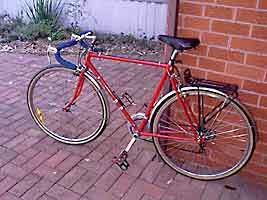 Although you hear many stories of bikes being stolen I doubt if many correctly locked bikes are stolen in Sydney. Locking your bike is really a process of risk management. The following advice, if implemented, will help to ensure that your bike is not stolen. The overall level of risk is related to the value of your bike and its attractiveness for thieves, the level of isolation of the area in which you will be leaving your bike and the amount of time you will be leaving your bike. Also if you lock your bike somewhere regularly it may be targeted by a thief who observes it in the same location as on a previous occasion. 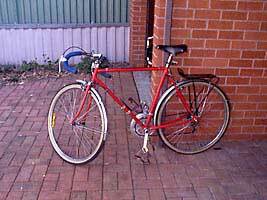 Keep an old bike of low value for use when you need to lock a bike in a public location. 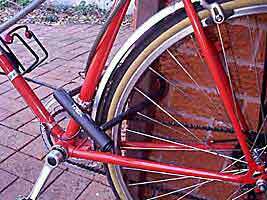 Lock your bike in an area where it cannot be observed or accessed by others. Or lock your bike where it will be continually observed by members of the general public so that a thief cannot work on your lock unobserved. Sometimes I will not bother locking my bike if I am leaving it outside a shop where I can keep an eye on it at all times; in these cases I use an old bike of little value. For example, I might use this approach if I am buying bread from the local bread shop. 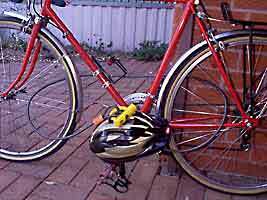 One way of increasing your level of security when leaving your bike unlocked is by adjusting your front and rear derailleurs without shifting the chain to the new gear. In this way if someone attempts to ride away on your bike the chain will jam, making it easier to catch them. Of course you need to remember to reshift the derailleurs before attempting to ride away yourself. 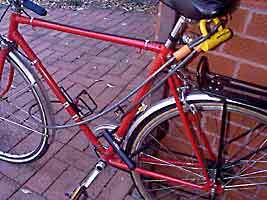 At other times I will use a lightweight, low security combination lock to lock my bike, often only locking the frame. Although this lock can be easily defeated it prevents would be thieves from riding away with your bike at short notice. I use this approach when I might be inside a shop for a few minutes and unable to observe my bike at all times. 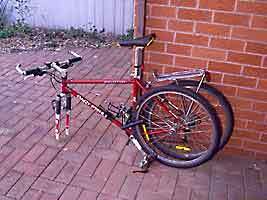 When doing this I usually use an old bike of low resale values so that it provides a less attractive target for thieves. The type of lock appropriate for use depends on where you are locking your bike and how long you are leaving it there, and also how much it is worth. The major lock types are U-locks as shown in the photo, and cable locks. More expensive bike, frame and front wheel locked with U-lock. With a larger U-lock it is also possible to lock the rear wheel at the same time. 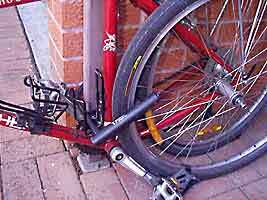 For high security applications it is best to use a U-lock. Remove the front wheel and lock the front wheel, frame and rear wheel to a fixed object, as shown in the illustration. 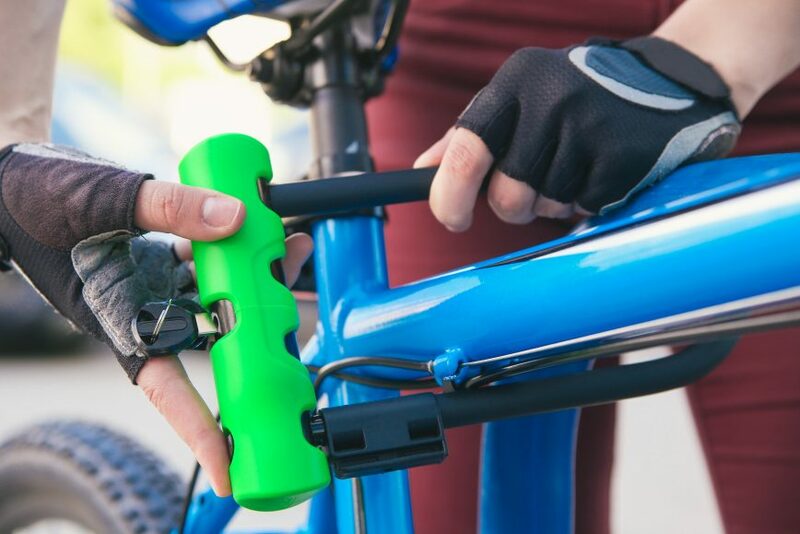 You need to ensure that the bike and lock cannot be lifted off the top of the object to which it is locked; for this reason do not lock your bike to a bollard. Sign posts are a good object to lock your bike to as they are fixed and it is not possible to lift the bike off the top. Cable locks are also handy, although not as secure as a U-lock. With a cable lock you can run the cable through the rear wheel, frame and front wheel. 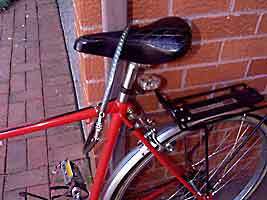 This means it is not necessary to remove the front wheel, making locking faster. 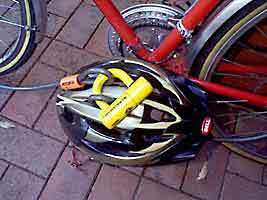 You can even lock your helmet to the bike with a cable lock, removing the need to carry this around whilst shopping or at work. 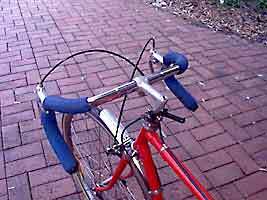 Another strategy for the highest level of security is to use a cable lock in combination with a U-lock. Lock the frame and rear wheel with the U-lock and use the cable to lock your front wheel and other accessories to the bike. Frame, front and rear wheels and helmet locked with cable. U-lock and cable used together for maximum security. I keep an old helmet for utility use. If I am using a cable lock I thread the cable through one of the ventilation holes on the helmet and leave the helmet locked with the bike. Older bike set up for local utility use, note the lack of accessories. 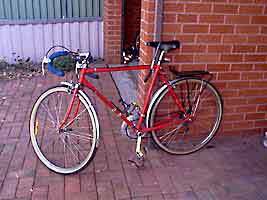 Older bikes like this are less attractive to thieves.